This guy is just really cool. Even if lui gives off a shamelessly casual impression, its covering makes it appropriate for any setting – and that’s how the designer Jacob Strobel views his piece. lui appears elegant and suave all at once. As chic as an easy chair, it nevertheless has all four of its feet firmly planted on the ground. These are linked transversely and point slightly backwards. Visible wood connections highlight the meticulous craftsmanship. 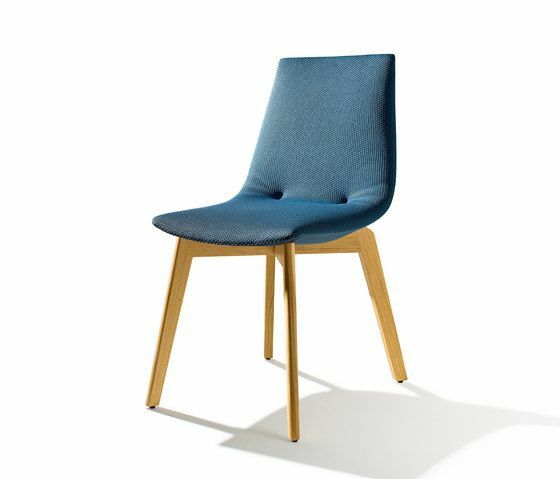 The seat of the lui chair nestles against the body and provides superior seating comfort, with its sculpted upholstery made of ergonomic foam material. The comfort of sitting on the chair is completed by high-quality leather or the especially cosy Softstrick cover. Always a smile. Similar to a garment, the leather cover fits snugly across the rounded back, while the inside is manually arranged to create leather folds – which give the subtle impression of laughter lines. It may seem spontaneous and accidental, but it has been covered using a single, consistent cut of leather, according to traditional upholstery craft. The double-stitched felled seam, familiar from classic denim, seems both casual and timeless. The Softstrick cover, which is made in one piece and envelopes the seat like a perfectly-fitting sweater, is just as ingenious. With little folds that indicate a wink, lui shows a friendly face in this version as well.